It was a welcome surprise to find out out that season 2 of the hit FX series American Horror Story would feature an altogether new story rather than a continuation of season 1. Now, with season 3 - subtitled Coven - just a couple of months out, we're learning more and more about the plot of the newest installment of the anthology series, thanks to teaser trailers, interviews, and more. Bassett: "Well, I play Marie Laveau. It’s been interesting, being in New Orleans, because there’s such a regard and respect for who she was. She lived to about 80 years old, and she was a very influential person in the city. My character is based loosely on her." Bates: "My Southern accent has come roaring back. Now that that cat is out of the bag, one of the things I enjoyed reading about Madame LaLaurie is that my great-great-grandfather came from Dublin to New Orleans in the 1830s, and he became personal physician to Andrew Jackson. And I read in the book on LaLaurie that his plantation was next door to theirs. So, I was very curious to know whether my grandfather ever met her because I think he would have been there just before she left. I thought that was interesting." For those unaware, both Marie Laveau and Madame LaLaurie are based on actual historical figures (though, as Bassett says, probably very "loosely"). Laveau was a renowned practitioner of Voodoo in New Orleans during the 1800s. LaLaurie, on the other hand, was more notorious than renowned - she was one of the few known female serial killers of her day. A Louisiana socialite, she tortured and mass murdered slaves and was eventually chased out of town by an outraged mob. BATES: "I went out for a drink with my friend, Jessica, after seeing the first season. And I said, 'You’ve got to get me on that show.' I thought it would be maybe a couple of episodes. So, I went in and sat down with Ryan [Murphy], and when he pitched this show to me, this little kid that lives inside all of us just started jumping up and down and running around. I said, 'I want to do it!' It just got me so excited that it washed most of the crap away. Clearly, there’s some residue. But, it’s delightful to be among such a glorious group of actors and have such magnificent material to play. I’m going on the record to say that we’re going to knock your socks off." BASSETT: "I just got a call to come in and meet Ryan. I watched every single episode, but to hear him talk about it, and knowing who would be joining the cast, and that it would be shot in New Orleans, which is one of my favorite cities – for the music, the food, the character and their love of death – and people from different strata live within 10 to 15 minutes of each other, it’s just very unique. There is such a history of that town, with free people of color, slaves, whites and Haitians. That I would be able to be in a city that I love, working with artists that I love, that obviously write for women, and to be able also to come home and not neglect my family for six months straight, it had everything going for it, as far as I was concerned." With Jessica Lange winning a Golden Globe, an Emmy, a Screen Actor's Guild Award, and more for her performance on season 1 (a.k.a. 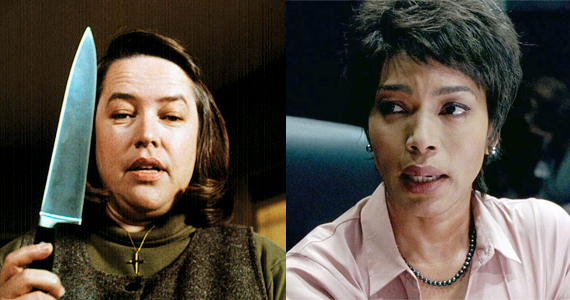 Murder House), it's not difficult to understand why great actresses like Angela Bassett and Kathy Bates would be raring to sign up. Ryan Murphy and company do some strange things on American Horror Story - some of which don't always pay off - but it has to be a pretty attractive opportunity for actors looking for meaty, original roles. Personally, I preferred the completely unpredictable season 2 (a.k.a. Asylum) to Murder House, so I'm really looking forward to seeing what Coven can bring to the table. It's not often that you have almost NO idea as to what's in store for the third season of a television series - and it's kind of refreshing. Will you be watching American Horror Story: Coven when it premieres, Screen Ranters? Are you looking forward to the witchcraft vs. voodoo storyline? Drop us a line in the comments. American Horror Story: Coven premieres October 9th, 2013 @10pm on FX.